October 2016 - Between 26 and 30 September 2016, the first Bachelor of Business in Culinary Arts and Bachelor of Business in International Hospitality classes started. 32 students, of 22 different nationalities (Nepal, India, Pakistan, Ukraine, United States, Portugal, Egypt, Colombia…), began studying business in international hospitality and the Culinary Arts at Le Cordon Bleu Paris institute. All these students have one thing in common: the desire to become managers in the Culinary Arts or hospitality fields. The brand new Business Bachelors, launched this year by the Paris institute, aim to help them achieve their goal. Following 3 years of studies, including internships in France and abroad, alternating practical experience and theory, the Bachelor students will become the managers of the future. In addition, students who have successfully completed the 3 year programme will be awarded an international “Talent in Culinary Arts and Hospitality Management” diploma from Paris-Dauphine University and a “Bachelor of Business in Culinary Arts Management” or “Bachelor of Business in International Hospitality Management” diploma from Le Cordon Bleu institute. 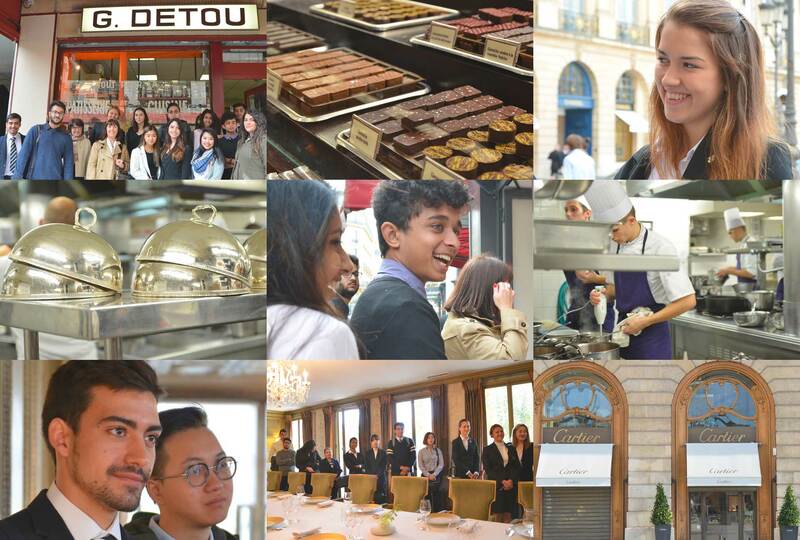 The students come from the world over and have chosen Paris for its culture, gastronomy, prestigious Chefs and luxury hotels … During their induction week, the students were able to live, taste and be amazed by all that Paris has to offer. A week which Le Cordon Bleu academic team were determined would leave a lasting impression and be inspiring, whilst at the same time helping students to understand French culture and to adapt to their new life in Paris. Guided tours of Paris, discovering the city, its history, its architecture and its luxury culture; Place Vendôme and the Ritz. Lunch at Chef Cyril Lignac’s restaurant: Le Quinzième including meeting the Chef and his team. Tour of the 3 Michelin-starred Pavillon Ledoyen, including the possibility of asking questions to Chef Yannick Alléno who seized the opportunity to offer a few words of career advice. Discovering the history of the Les Halles district during a “gourmet tour”: increasing their knowledge of French products and the history behind them. Visit to the Garnier Opera and a fashion show, during Fashion Week, were all included. The students, from the four corners of the globe, were curious minded and attentive but also got to know each other better. Their training programme begins with a variety of lessons, visits to hospitality establishments and meeting top French Chefs. These meetings will help them to choose their speciality in their 2nd year: Business in Culinary Arts or Business in International Hospitality. Until then, we are going to keep track of their progress on a regular basis so that we can share the key moments of this new class. These new managers will go on to become ambassadors of our culture and of French excellence.